July 27 1886 The first plat of the new town of Sarasota (December 1885) was recorded. 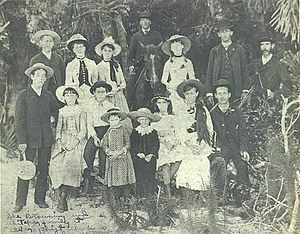 This photo was taken in 1886 of the Whitaker family, considered the first documented permanent residents of European descent in this area, and the Brownings, who came from Scotland with the Ormiston Colony in December 1885. By this time, William Whitaker and his wife and children had lived in Sarasota for over 40 years. This entry was posted in History Fun, This Day in History. Bookmark the permalink.